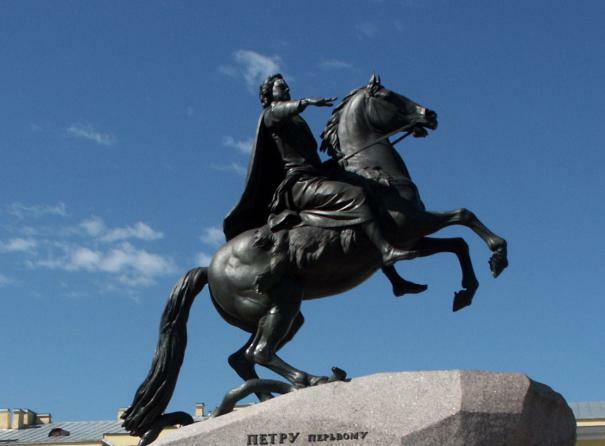 Inspired by Falconet’s Peter the Great, Aleksandr Pushkin wrote a narrative poem entitled “The Bronze Horseman: A Petersburg Tale” (1833) that recounts the city’s history. This is an excerpt. His visage to Yevgeny turning! The charger, clanging in his flight. There the bronze horseman gallops still. Translated by Waclaw Lednicki, Pushkin’s Bronze Horseman (Berkeley, CA: University of California Press, 1955), p. 150. Brian Grosskurth, “Shifting Monuments: Falconet’s Peter the Great between Diderot and Eisenstein,” Oxford Art Journal , vol. 23, no. 2 (2000): 34-5. “The statue of Peter has had a magic mantle of protection. When Napoleon threatened St. Petersburg in 1812, [Tsar] Alexander I gave orders to have it dismounted, placed on a ship and taken to safety. But Prince Golitsyn told him of a dream of an officer who saw Peter and Alexander together and heard Peter tell Alexander that nothing would ever menace his city. Alexander, believing the dream, commanded the statue be left in place. Ilse Bischoff, “Etienne Maurice Falconet – Sculptor of the Statue of Peter the Great,” Russian Review, vol. 24, no. 4 (October 1965): 385-6.